The upstairs of The Royal Oak is a deceptive place. You squeeze through a heaving East London crowd downstairs, flowing and oozing like a giant shoal of well dressed fish. The Royal Oak is ALWAYS rammed. I’ve been here on several occasions at different times of the week and never found a seat – this being a Friday and my friends and I feeling lazy, we booked a table upstairs, thinking the bonhomie would rise, like heat. We were wrong. Upstairs is empty – there was a maximum of five covers at any point. The menu is different too, as the waitress pointed out when we asked for the downstairs dishes. They’re trying to distinguish themselves from pub food to fine dining – although the toilets were broken, so you had to do your business with the common folk below. 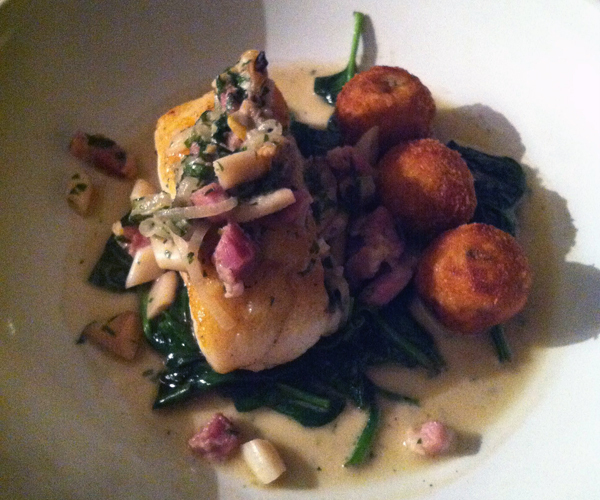 I ordered Roast cod fillet, clam and smoked bacon fricasse and salt cod croquettes with a side of chourcoute (the waitress was just as clueless as to what that is as me – cabbage with bacon). My friend O ordered 450g T-Bone steak, triple cooked chips, mushroom ketchup, shallot rings and M a portion of Braised belly pork, crackling, celeriac gratin, black pudding and a side of Honey and sesame seed parsnips. Then – it was cold. Stone cold. I inhaled my food (it was barely four spoons worth anyway) and didn’t really notice until I was finished, but it was more of a cod salad. Plus it was very, very salty. The clams were like little shrivelled bombs of salt detonating with every mouthful. I was completely unsatisfied and watched morosely as my friends polished off their far more meaty dishes. And it seemed their dishes were as tasty as they were large. 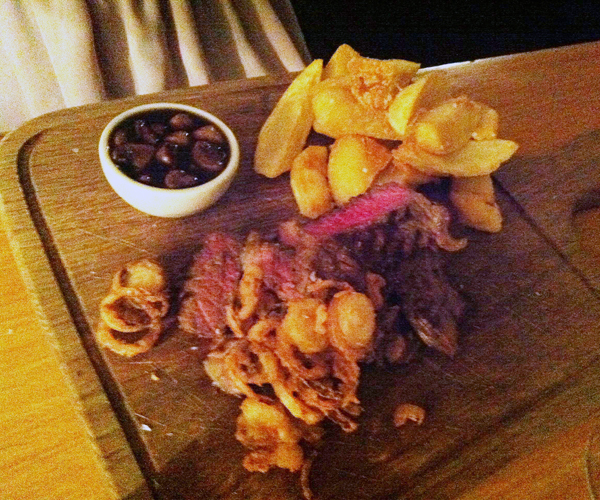 O enjoyed her steak, describing it as “good – not chewy” but “hard to appreciate cold.” The onion rings were “more like batter crisps” and the chips “better than your average”. M’s pork dish was the clear winner of the evening, as she described the pork as not too fatty with “perfect” crackling. 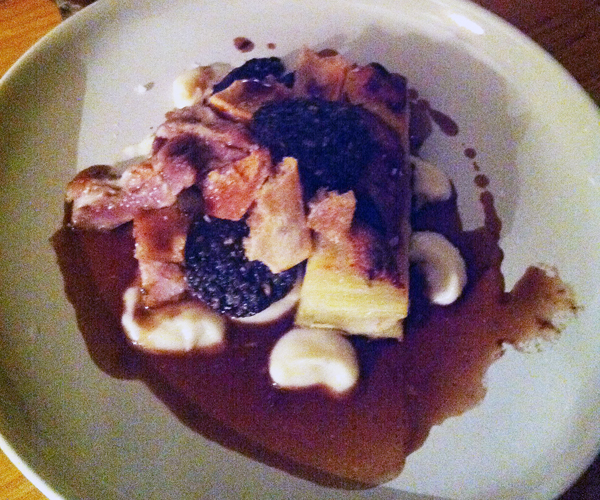 The black pudding was a pleasant surprise – “a good accompaniment to the dish” and the gratin “delicate”. But it was still cold. The parsnips – which I had been secretly snaffling when she wasn’t looking – were over caramelised to the point of resembling parsnip candy, probably because – you guessed it – they were cold. I was scratching hard lumps of honey and sesame off the plate in my desperation to eat. Halfway through, the waitress came to check how the meal was, and disgruntled by my sorry lot, I told her. Mock surprised (although the waitresses were lovely all evening) she apologised and told us we should have sent it back – which would only have resulted in a quick blitz in the microwave methinks. Our overall impression was that they had been left on the pass and forgotten – whether by the chefs calling them out or the waitress meant to pick them up, we couldn’t be sure. A round of complimentary drinks later, and our bill came – minus another round of drinks we had already ordered. Either really great customer service or someone was feeling guilty. Despite this, my dish, minus booze and tip, still came to a hefty twenty one pounds – an absurd amount for what was tantamount to a chilled starter. We took our complimentary drinks downstairs, where the hipster buzz felt far more welcoming than the eerie emptiness of the tables above. Typically, we then found seats within minutes, although it was last orders by this point. My recommendation if you’re ever down Columbia Road is to stay downstairs and wait for a table if you want to eat – it will be worth it. The menu is far more diverse, and I suspect, comes in bigger pub grub portions, and it’s clear the kitchen prioritise their orders over the stuffy menu upstairs. The atmosphere is great too – just never go upstairs. Ever. Visit the Royal Oak website to find out more.